Designs by Lisa Somerville: Dreaming of Frosty! With all the hot weather we've had this past week, I'm dreaming of Frosty, and a drop in temperature! The fab vintage image is from the new Artistic Outpost Frosty & Friends plate, stamped in Black Archival on Vanilla card stock and colored with Copic Markers. Walnut Stain Distress Ink is sponged on the edges for an aged look. I used the Bag It Template, cutting from Red card stock, using the eCraft. I added snowflakes from the Snowy Woods plate to both the bag and tissue paper. 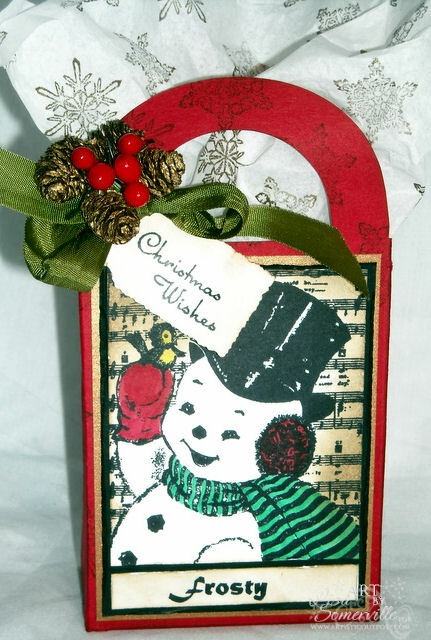 Lisa - what a sweet vintage style Christmas bag. I do like the snowman and his sweet ear muffs!! Frosty sure makes that template special! Adorable little gift bag with Frosty! Love the pinecone embellishment! Love this treat bag! Frosty is adorable and the added embellishments are perfect finishing touches!